Bruton Smith, shown here in a 2013 photo, was pleased to be back at Bristol Motor Speedway this weekend. 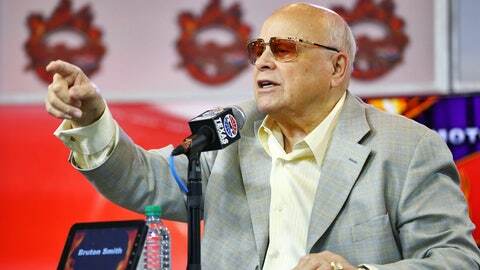 Speedway Motorsports Inc. executive chairman Bruton Smith revealed Friday that he was treated for non-Hodgkin’s lymphoma in June and used this weekend’s races at Bristol Motor Speedway as motivation during his recovery. Smith arrived at Bristol on Wednesday for the Truck Series race — his first since his diagnosis — and will stay until Saturday night’s Sprint Cup Series event. He missed a total of four race weekends at SMI properties while he was ill.
”He’s been given a really good prognosis on his health, he’s responded to the treatment really well and beyond the expectations,” Marcus Smith said. The behind-the-scenes restructuring at SMI led to speculation about Smith’s health, which is why he agreed Friday to reveal what he’d been through the last few months. ”I think I feel a lot better than some people thought I did,” he said. The restructuring at SMI has put Marcus Smith in charge of day-to-day activities, although Smith said he’s still showing up for work at his office at Town and Country Ford in Charlotte, North Carolina.